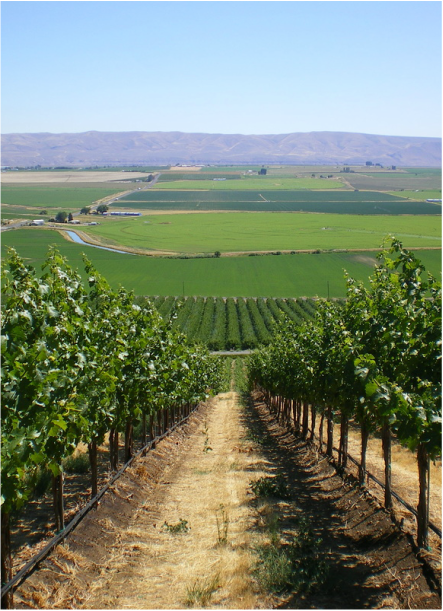 Since 1825, Washington state has been planting, producing and delivering wine. Its magnificent history and culture ties into winery as much as everything else in this world-renowned state. Over the years and decades, Washington wine has developed and discovered a new aspect every time. In the 1970s, they discovered Riesling and Chardonnay, then found Merlot in the 1980s along with Cabernet Sauvignon and Syrah in the 1990s. Wine from Washington can be right up your taste alley and you might not even know it. 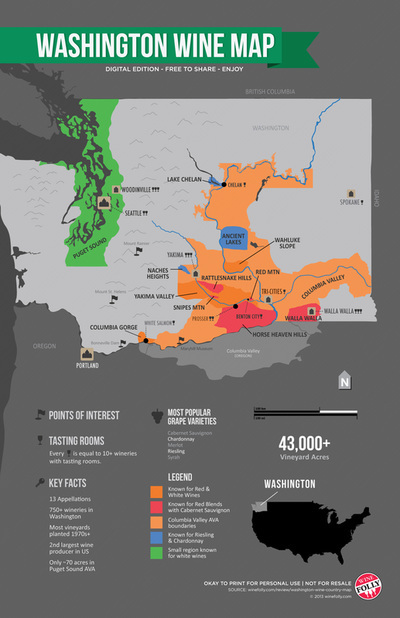 Here's an idea of Washington's wine varietals to give you a look into what you could be exploring. It also ranks second in American wine production, behind California. The leading white varietals in Washington are Riesling, Chardonnay, Pinot Gris, Sauvignon Blanc, Gewurztraminer, Viognier, Semillon and Chenin Blanc. As for the red varietals, the leading are Cabernet Sauvignon, Merlot, Syrah, Cabernet Franc, Malbec, Sangiovese, Petit Verdot and Pinot Noir. 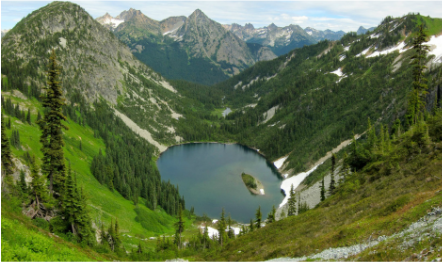 As seen, the variety of wine production in Washington is large and you can certainly find something that fits you. In fact, in 2014, Washington state made a record of producing 227,000 tonnes of wine in one year. Starting with 19 wineries in 1981, Washington has now come to produce wine in over 850 wineries across the state. In 2006, The Wine Advocate gave two perfect scores of 100 points for Cabernet Sauvignon wines made by Quilceda Creek Vintners using grapes from several Washington vineyards. 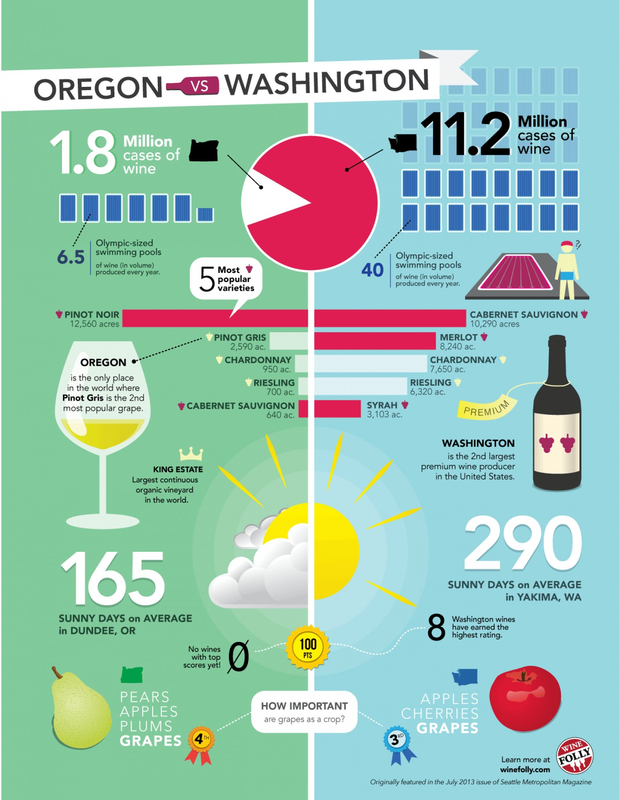 Wash​ington state grows 53% white and 47% red wine, and has over 40 varietals produced.